Market Day at Birka, in the Barony of Stonemarche, has a long history. 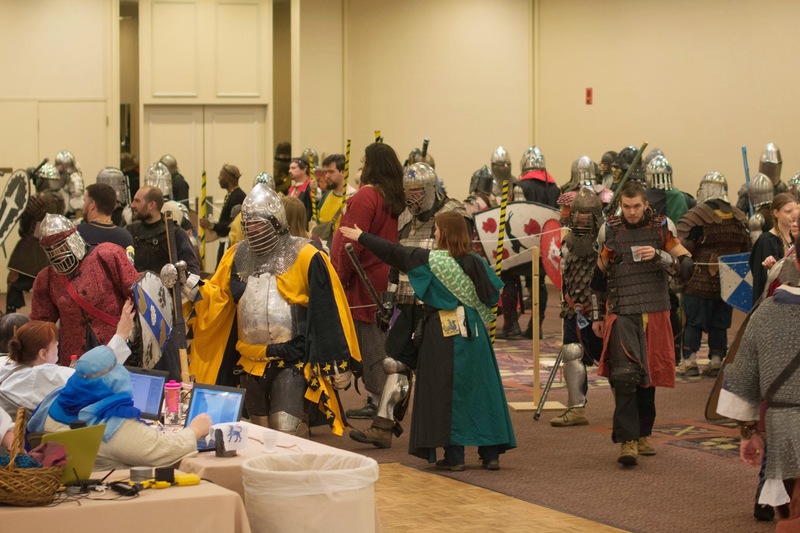 This will be the 28th year of the event, and the 15th year since it moved to the Radisson Hotel and the Center of New Hampshire Expo Center in Manchester. Every four years the event scheduling gets a bit nerve-wracking because of the proximity of the traditional date to the New Hampshire Presidential Primary, and of course the potential for a catastrophic blizzard on the event weekend is always a background fear. It is the end of January in New Hampshire, after all. This year when the autocrat, Mistress Fia Kareman, and the Seneschal of Stonemarche, Lady Tomyris of Stonemarche, approached the hotel to sign the contract for Birka 2017, the hotel management warned them that plans were afoot to renovate the ballroom, which is the traditional location for Heavy List and Royal Court. Renovations were expected to begin in December, and to continue through March. This, as might be expected, caused considerable consternation. Mistress Fia and Lady Tomyris kept the news very close while they considered options, because they were concerned that rumors of the problem would run wild, and be difficult to combat, even after the matter was settled and facts could be presented in their place. They considered a number of options, including whether it might be possible to rent additional space from other nearby buildings. That option proved to be unworkable, as no suitable space was available. In the end, Mistress Fia went back to the hotel with a list of requests for concessions and options for alternate spaces which might be usable. The hotel management, mindful of their long and positive relationship with the event, made every effort to help Stonemarche find ways to squeeze in as many of the traditional activities as was remotely possible, including reserving for the event’s use parts of the hotel, such as the fireplace lounge area in the lobby, which in most years are considered public spaces, not part of the event space. Even after a lot of outside-the-box thinking, and efforts to find usable spaces that are not normally rented by the event, there was still substantially less space available. Event staff tried to cut back on everything a little, to avoid completely dropping anyone’s favorite, traditional activity. Heavy list was moved from the ballroom to the armory. Youth fighting was moved out of the armory into a meeting room, to make room for the heavy list. 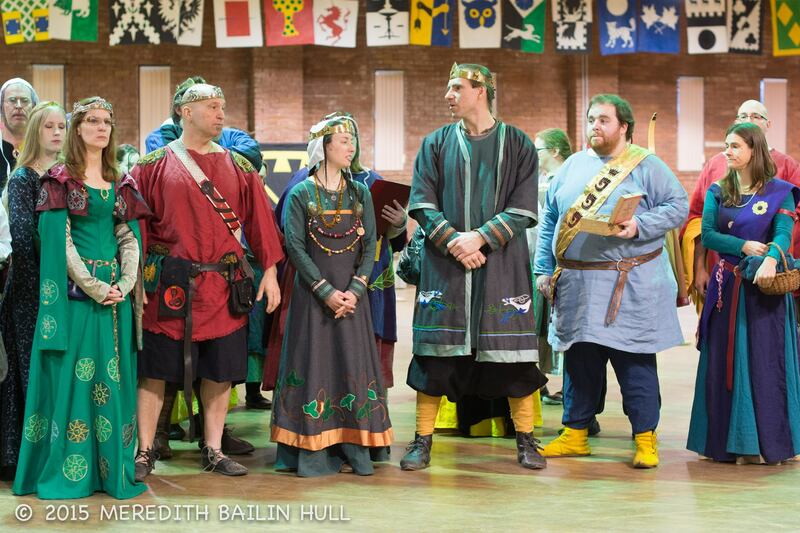 Evening Royal Court will be in the armory, as will the Ball. Because acoustics in the armory are so challenging, for the first time the event will be providing a sound system for Court. The Middle Eastern Hafla will be in the public space outside the Hale and Spaulding rooms in the Expo Center, as well as in the adjacent Pierce room, instead of the Armory. By early May details were settled, the contract was signed, and the changes were made public to the event staff and via various electronic channels. While nothing was perfect, the essential parts of the event were preserved, and it is expected that things will return to their normal locations next year. However the story doesn’t end there. Renovations rarely proceed exactly on schedule, as anyone who has been part of one knows. Approximately two weeks ago the hotel informed Mistress Fia that the work of refinishing the armory floor had been completed. This caused great stress to the staff, because Stonemarche knows from painful past experience how badly fighting heavy list can damage a floor. Again, the hotel worked with the event staff, and a fix was found. The hotel is supplying mats to protect the floor in the armory. At the final pre-event planning meeting, held at the hotel on the 15th, it was noted that there seemed to be no access route to get from the hotel proper to the armory. This was seen as a significant issue, since it is January in New Hampshire, and weather could be anything. It was felt that event attendees should not have to go outside to get to the armory. Mistress Fia again went back to the hotel to seek a remedy. This time the proposed solution involved going through the Curriers room, which in past years has been the Royal Room. That presented its own challenges, as there were activities scheduled there, and now a home needed to be found for them. The hotel offered the use of a suite in the attached office tower, which is space entirely new to the event. Youth fighting, Baronial Court, the Fashion Show, and the Bardic Circle will be held in that space. As this change was instituted after the site books had gone to the printer, there is an addendum to the site book and signs will be posted to help attendees find the new space. The event staff hopes everyone will enjoy the event in spite of the challenges occasioned by the construction. Scroll Display at Birka – Scrolls, Portfolios and Volunteers wanted! As Birka is fast approaching I’d like to remind everyone that there will be a scroll display from 10am-4pm in a room located on the mezzanine above the concierge. Please bring Finished Estrella War scrolls, award scrolls, as well as your portfolios to display. All award scrolls and portfolios must be picked up at least 30 minutes before the close of the display. Thank you all in advance for the contribution of your time and talent. We will be holding an East Kingdom Chatelaine’s Meeting at Birka, on Saturday the 26th. It will held from 10am-11am, in Room 2. Any and all Chatelaines from across the Kingdom are invited to join, to meet and greet, and go over a few key points. A more specific agenda will be provided on the Chatelaine Yahoo Group.